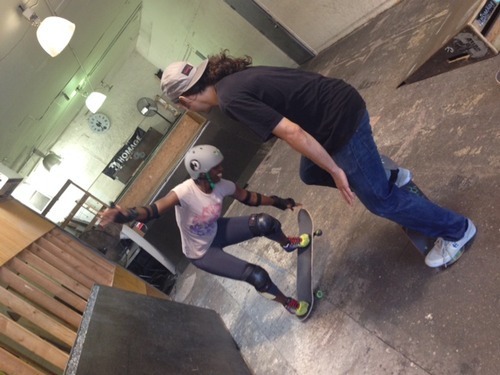 The first stop on our impromptu quadrup-athlon (yes I made this word up, clearly) was skateboarding lessons at Homage Brooklyn. All the guys there were super sweet and showed both Dheron and I a few techniques. Now I am in no way next Tony Hawk, but after an hour I was able to go 3 feet on the board without falling off. and I could do this. Success! After an hour of baby footing down the smallest ramp, we went a few doors down to Brooklyn Boulders. this place is so fun! 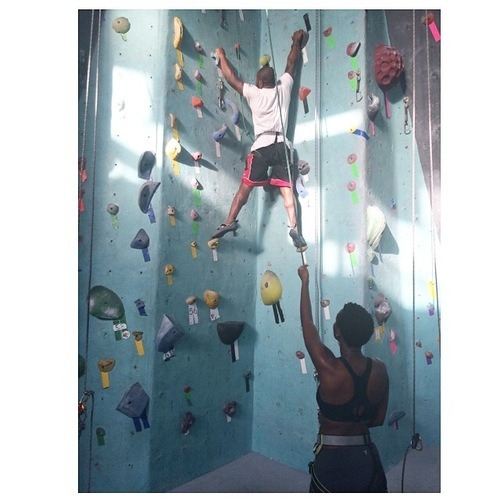 they have sport climbing, bouldering, weight training, aeriel yoga and much more. A few days prior we attended a class to become belay certified, and the pic below is us performing our test. I don’t know the next actual mountain I’ll be climbing but I think it’s a pretty cool skill to have, and may come in handy one day…you never know! Climbing is such a good workout for the arms and back, after an hour your forearms are on fire and so tone. While we were on our way to the Brooklyn Boulders we passed a Crossfit gym http://www.crossfitsouthbrooklyn.com/. My boyfriend stopped in to inquire and they just so happened to be giving a free introductory class later in the afternoon. Never the one to turn down being active, Dheron signed us up! We arrived at the class and there was another couple, and two girls there. Both Dheron and I are very competitive, so without even speaking to each other we knew that we had to beat the other couple. Which we did! I actually had the most reps in less time out of all the women and Dheron smoked the guy. Not that it’s all about winning…but isn’t it? Fittingly we finished off our day of fitness with stretching and deep breathing in a 105 degree room. I wrote about Bikram Yoga in my last post, and the classes we take at the Williamsburg studio. This class was particularly hard because of all we did that day, but we got threw it. The great thing about this day was that most of the activities were free! It was also a fun way to stay active without being on the treadmill or lifting for hours. What are some of your favorite activities in the city? I haven’t posted about my hair in forever it seems. My next post will be my Shea Butter mix receipt for sealing my ends!